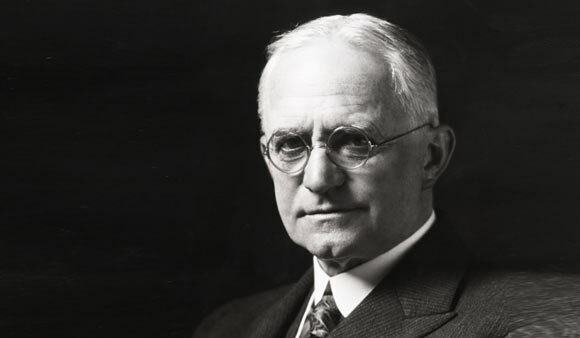 George Eastman was a renowned American inventor, businessman and founder of the Eastman Kodak company. He was born in 1854 in New York to George and Maria Eastman. His father died in 1862, when Eastman was 8 years old and one of his sisters died when he was 16. As a result, he felt the burden of responsibility and dropped out of school at an early age to begin working in order to support his mother financially. He was mostly self educated, and started off his career with odd jobs at insurance companies and banks. At the age of 24, Eastman planned a trip to Santo Domingo when his colleague advised him to document the trip. The photography equipment however, was bulky and expensive. Eastman began to think of ways to make photography more manageable. He cancelled his trip, bought some photography equipment and began to research extensively on alternative methods of photography. He collaborated with amateur photographers and other inventors and by 1880, he had developed a gelatin based paper film. At this point he left his job and founded a small photography company. In 1885 he obtained a patent for a “roll holding device” that he had invented together with another inventor named William Hall Walker. Together the two of them had invented a much smaller and cheaper camera. Eastman named his company “Kodak” (later changing it to “Eastman Kodak”) and launched the first Kodak camera in 1888. It was a compact box shaped device which could take 100 pictures and cost only $25. He coined the slogan “You press the button, we do the rest” in order to promote his products. His company also developed flexible film that could easily be inserted into cameras. This was a huge success and was even adapted by Thomas Edison for use in motion pictures. In the 1890’s the company suffered some financial setbacks due to the depression but recovered again by 1900 with the launch of the Brownie Camera for the price of $1 which was a huge success. Eastman also developed an unbreakable glass lens for use in gas masks and a special camera for taking pictures from planes, which was used in World War I.
Gerorge Eastman was never married, and had a close platonic friendship with his friend George Dickman’s wife named Josephine Dickman. He was very close to his mother and credited all his success and fortune to her as she had dedicated her entire life to helping him prosper. When Eastman’s mother died, he admitted to having cried for days at her loss. He established the Eastman Theatre in Rochester, New York and named the chamber music hall “Kilbourn Theatre” in her honor (Kilbourn was his mother’s maiden name). Eastman was a great philanthropist and gave away huge chunks of his fortune to needy and deserving people. During his lifetime, he is thought to have given around $100 million to universities, hospitals, dental clinics and research facilities. He sometimes used the alias “Mr. Smith” when making donations as he never wished for publicity and fame. Some of the notable organizations he donated to were MIT, Rochester University and the Royal free Hospital. He established several charitable organizations of his own initiative such as Eastman Dental Clinics in London, Rome, Paris, Brussels and Stockholm. In 1932, George Eastman committed suicide by shooting himself in the heart. The cause of this was a painful and degenerative spine disease which made it difficult for him to function normally. He left a suicide note which read “My work is done – why wait?”. Eastman’s legacy lives on and he will always be remembered and appreciated for his contribution to widespread commercial and personal photography. His net worth at the time of his death was US $95 million. After his death, his house in Rochester was converted into the “George Eastman House International Museum of Photography and Film“.